With 15 years of music performance experience and a BM and MM in flute performance, you can expect the highest quality lessons from me. I have years of experience teaching dozens of musicians of all ages, and I make sure to adjust my teaching to the needs of each student. Everybody is different, and I want to make sure that students get the most out of their experience! I have given dozens of recitals and performances, including many competition appearances and academic auditions, so when it comes to performing, I know exactly what it takes. Drew delivers an exceptional lesson experience and ranks in the top 15% of our teachers nationwide. 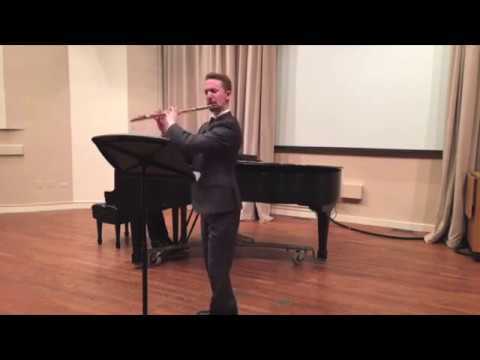 As a recent recipient of a Master's Degree in Flute Performance from Northwestern University's Bienen School of Music, Drew Powell is a promising young flutist and highly sought after flute teacher. For 15 years, he has participated in numerous music competitions, festivals, and performance opportunities, both as a soloist and part of ensembles, and actively continues to do so. He is an advocate of the arts and passionate about spreading the gift of music, which has lead him to teach over 30 students (and counting!) in just the past 3 years. Drew won the 2017 Myrna Brown Artist Competition (an international competition with no age limit) hosted by the Texas Flute Society. He was recently invited to be a guest artist at the 2018 Texas Flute Society Annual Convention, where he taught several masterclasses and gave solo performances. I seek students who share a love of learning. I am not looking for the finest musicians or highest IQ's, because those gifts are not required to learn and grow. My greatest experiences as a teacher have come from when I work with students who just want to learn more. I hold my students to high expectations when it comes to practicing. Each week, I give students individual assignments that I know will improve their learning and playing abilities, and I expect those assignments to be fulfilled by the next lesson. A failure to do so will result in frustration for both myself and my student. However, I know that nobody is perfect, and I myself have had my share of weeks where life happens, and I simply don't progress as much as I would like. As a teacher, I understand this perfectly, and I will always strive to listen to my students, and work with them through their difficulties or struggles. I bring a lot of energy to lessons! I am very passionate about teaching and helping students grow, and I make sure to bring that to every lesson. I give concise, direct feedback to students, making sure to give them the information they need to understand how they can achieve their goals and grow. I am very perceptive of students' feelings, and I take care to be sensitive to their needs each week. My worst fear as a teacher is to cause hurt feelings, so I will do everything in my power to avoid that! I am an expert in the field of music and the flute, so you can be rest assured that the quality of instruction will be the highest. My passion for teaching flute has lead me to teach nearly 20 students in just 2 years. I have been playing flute and taking lessons for 15 years now, so I know what it takes to learn and master the instrument. I have taught brand new beginners to advanced high school and college-aged students. No matter the age or experience, I promise to bring unique, quality teaching to each lesson. My two kids have now had five piano lessons with Drew and we have booked further. My impression on day one had been that he is highly motivated, energetic and professional. His relative youth combined with authority makes him a great teacher for teens. First impressions were correct. I heartily recommend Drew for Flute and Piano. Excellent first impression. Drew came across as friendly, motivated and in control enough to manage my younger one. With the elder one he was great too. Look forward to the lessons. Will post am update after a couple of weeks. Drew was very knowledgable patient & helping me understand everything. Looking forward to my next lesson. I take flute lessons from Drew. He is a real flutist with musical talent and technique. Not only that but he has such good eyes and ears to tell me what I am missing. He corrected me things that none of my past teachers mentioned to me. I really enjoy playing so I keep practicing till I can play like him! My daughter had Drew as her first teacher for the 2015-2016 school year. He was excellent at explaining concepts and techniques to her as she began to learn the flute. He helped her to have fun as she learned. He is patient, knowledgeable, positive, and communicates concepts and expectations well. We would have loved to have him stay in the area and continue as her teacher. I had the privilege of having Drew as my private flute teacher for the 2015-2016 school year, and I would have loved to remain his student if he hadn't moved. He's incredibly patient, thoughtful, and hardworking, and he helped me correct problems that previous teachers never even noticed. I improved in so many areas in a short period of time, including overall tone, physical technique, performance psychology, practice habits, and applying musicality to my performance. Easily the best teacher I've ever had.